Generally when traveling, getting there is half the fun. This Memorial Day, getting there might be half the battle. AAA predicts that more than 38 million Americans will be traveling this holiday weekend, the second-highest Memorial Day volume on record. All of them will seem to be going in your direction. None of this bodes well for the easily annoyed. Then comes the germ-sharing, the extended sitting, the excessive sun and too much bad food – or too much good food. All of these can take the fun out of what most people regard as the kick off to the summer season. Dr. Mark Morocco, an emergency medicine physician at Ronald Reagan UCLA Medical Center and an arbiter of all things medical, offers this typically oblique advice: “Pack light, plan easy and leave early. And bring plenty of dolphin snot.” We’ll explain later. For more prosaic advice, we turn to the UCLA Health Library, which is chock-a-block full of practical tips for those in search of safe, or healthy, adventure. If you’re driving, first and foremost: Stay awake. One tip: Don’t slouch. It’s good advice in general, even more so when you’re behind the wheel. Read more tips for how to stay alert while driving. If you didn’t know – or refuse to follow – the tip about not drinking and driving, do everyone a favor and stay home. If you’re flying, packing those medications in your carry-on luggage is just the beginning. Every passenger should drink plenty of fluids (but perhaps not so much you have to monopolize the bathroom) and avoid alcoholic drinks. But people with circulation problems, epilepsy, diabetes and those prone to motion sickness should take special precautions. The latter group should eat a light meal ahead of time. Read more tips for air travel and tips for traveling with chronic conditions. If you’re traveling abroad, avoid food from street vendors and drink commercially bottled water or carbonated beverages. To be kind, we will not share a particularly unpleasant story involving a school group, a restaurant and dragon fruit juice. Read more tips for eating healthy while traveling abroad. If you have asthma, reserve a non-smoking hotel room (you probably knew that) that’s also away from damp or wet areas (you might not have known that). If you’re staying with friends or relatives, warn them that scented candles or sprays are not conducive to your comfort. Don’t be shy. They’d rather ditch the prettily scented products than watch you suffer. 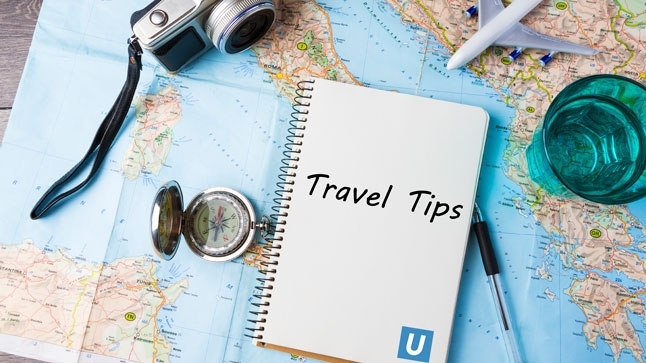 Read more tips for travelers with asthma. Tips for traveling with children. Special note No. 1: See advice above about motion sickness. Special note No. 2: Give children sunglasses to help reduce their visual stimulation. Be forewarned there’s nothing here about how to stop multiple children from arguing about who got the better sunglasses. For that, check out information about headaches and how to prevent them, specifically the part about known triggers. Tips for those who must be hyper-prepared: what to put in a traveler’s first-aid kit. Tips for exercise while traveling. Some are obvious: Take the stairs. Some are kind of cool: Check out a walking tour or bike-share program. Some are wonderfully on-point for the foodies: Swimming burns a lot of calories. And more, more, more in our Health Library. As for Morocco’s advice, he was explaining in his imitable way “how to have a holiday in which you decrease your endogenous epinephrine, lower your blood pressure, sleep well and get refreshed.” The dolphin snot reference was just a shout-out to this truly delightful Washington Post story about the same. If it’s the predicted crowds that are damaging your calm, read these tips on how to control your temper -- or take a deep breath and remember that Memorial Day really isn’t about the start of the summer season. It’s about remembering those who died in the country’s armed forces. A little perspective never hurts.